Such a complex movement – and such that we can not simply say “they want the RIC” [référendum d’initiative citoyenne/citizens initiative referendum] or “they want a Fifth Republic” – forces us to no longer think of violence in relation to its purpose: violence expresses a disgust (of capitalism could we say? ), it does not propose anything. The idea that the “yellow vests’ movement” – always thought of as an ordered and unique entity – had at the beginning “legitimate claims”, which then dissolved into “gratuitous violence” has become a tirelessly repeated constant in the media, and by their viewers. Note that the expression “legitimate claims” is always elliptical: the media are content to evoke a legitimacy, without ever specifying, even allusively, the content of these claims – a pretty sleight of hand that dispenses these media with questioning themselves on the political background of the movement, to only criticize its form. In other words, we must be wary of all those who use the expression “legitimate claims”: it is often, but not always, to disqualify the movement, to avoid any proper political thinking. The media criticism of “gratuitous violence” is based on the assumption that all action is directed towards a goal that can be represented a priori, towards concrete demands, and the legitimacy of this action is therefore measured and judged, not by its cause, but by its goal. Violence is always analyzed in relation to its purpose, in relation to its demands (just as sexual desires would be directed towards reproduction). Western conception, shared by some of the left, notably the Leninist left: the revolutionary vanguard envisaged by Lenin would be avant-garde in that it would allow a priori a clear representation of the goals to be attained by the revolution making revolution an ordered means to those ends. This does not disqualify or contradict those on the extreme left who propose models of government; it is not a question of saying that the violent ones do not have concrete demands – some of them – it is to say that the violence is not directed towards these claims. In other words, the political act that threatens to remove power is the aimless act, which will be called violence. It is this violence that interests the contemporary philosopher Giorgio Agamben, who, in the end of Karman and in Means Without End (after a historical analysis of the metaphysical and Western primacy granted to action, directed towards a goal) develops an ethic of “gesture”. Thought in the manner of the dancer’s gesture, whose meaning is not to be found on the side of any goal (less classical dance than contemporary dance, suddenly), the political gesture is a means without end. There may be something of the gesture in the proletarian general strike, which Walter Benjamin, in the Critique of Violence, opposes to the strike which is exercised within the framework of the law – and which, as far as it is exercised in a framework, is already the acceptance of an order of things where this strike would have its place, confiscating any possibility of contesting this order. The true strike gesture can only be a strike that goes beyond the right it has been granted. It is the same for the demonstration: there is the authorized demonstration, institutionalized, with its path, its demands; and the wild protest, the riot. The gesture is played out without any authorization, it is always wild, where any demand is already of the order of the acceptance of the world in which one is. Thus, many collectives of 68 affirmed that one should not claim anything: “be realistic, ask the impossible”. This pure gesture, refusal of the rules of power, is always unbearable for the authorities. It is its destitute power. On the contrary, pacifist and authorised demonstrations, with their path and their demands, are always bearable, always comfortable for those who exercise power, for example a government. The political act, as opposed to voting, is when people invite themselves in and break into an institutional game determined by power. This is perhaps anarchism: to reject the rules of the game, to expect nothing from power, to give up the idea that the power will grant anything, to grant oneself. 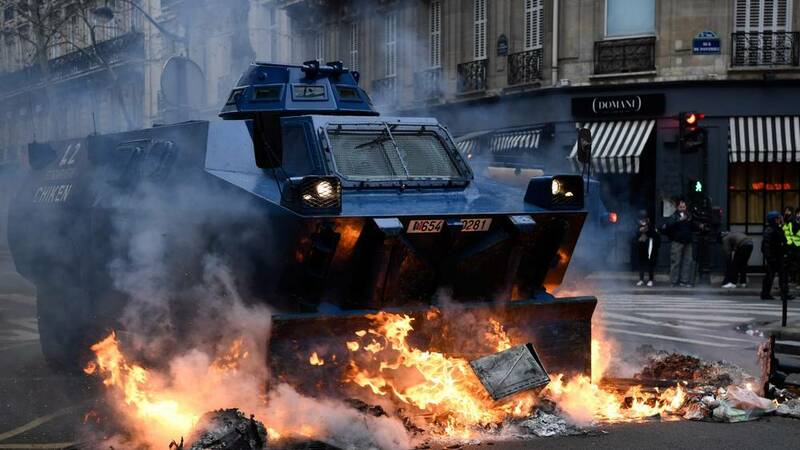 This entry was posted in Commentary and tagged france, gilets jaunes, insurrection, revolution, Violence. Bookmark the permalink. 1 Response to The gilets jaunes: What violence?